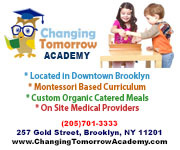 $200 family sessions ($50 discount from the normal price) for Park Slope Parents members. Comment: My wife and I had a great experience working with Jenna Salvagin. She took photos for our engagement and wedding, but she does family photos too.